Firms looking to hire foreign professionals will soon face tougher hiring rules, but those that give unemployed Singaporeans a shot at the jobs will receive financial help to offset their wage cost. From Oct 1, firms will have to state openly the salary ranges of the professional, managerial and executive (PME) jobs when they advertise their vacancies in the government-run national jobs bank. 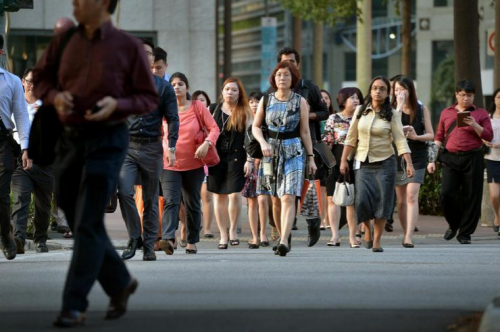 This will ensure that there is transparency and accountability in the hiring process so that Singaporeans will not be short-changed, said Manpower Minister Lim Swee Say yesterday. When these firms subsequently apply for foreigners to fill the vacancies, some may be singled out by the Manpower Ministry (MOM) to show proof that they tried to hire Singaporeans, such as having interviewed them. This will put firms under "greater scrutiny", Mr Lim said. In an extreme situation, firms that already have a higher ratio of foreign staff, compared to their peers in the industry, or those that the ministry feels may not be highly committed to hiring locally, will be asked to implement plans to reduce their reliance on foreign PMEs before Employment Passes are approved or renewed. "We are not going to treat them on equal basis (as other firms)," said Mr Lim, adding that the ministry has already put the hiring processes of about 150 firms under greater scrutiny. The MOM will also reject work pass applications outright when it doubts the qualifications of the applicants, noted Mr Lim. Previously the ministry rejected applications only from those who had forged their education certificates. Firms will not just face the stick when they try to hire foreign PMEs. Carrots will also be dangled under a Career Support Programme to coax businesses into giving unemployed Singaporeans a crack at the jobs. Employers who hire unemployed PMEs age 40 and above in jobs which pay at least $4,000 a month will receive monthly wage subsidies of between $400 and $2,800 for one year. Those who hire older workers will receive higher subsidies. The programme will run for two years from Oct 1. Besides the wage subsidy, the Singapore Workforce Development Agency (WDA) is also looking into hiring professional headhunters to help unemployed PMEs find jobs. The headhunters will be announced before Oct 1. After the measures are implemented, the MOM will set up a tribunal in the first quarter of next year to help PMEs with salary or work-related disputes. Workers will be able to turn to the tribunal regardless of how much they earn, said Mr Lim. The Singapore National Employers Federation (SNEF) and NTUC said they supported the MOM's moves. However, the SNEF asked for some work pass approvals to be sped up. "MOM could facilitate faster approval of work passes for experienced and highly skilled foreigners and those from renowned educational institutions," it said in a statement. Meanwhile, labour MP Patrick Tay, an NTUC assistant secretary- general, said unions will work with firms and the Government to ensure that workers who need help get it. MOM's moves will make older workers more attractive to employers, said Association of Small and Medium Enterprises president Kurt Wee. He said: "For the past four or five months, SMEs were not hiring... (Now) we have a greater chance at converting and upgrading the skillsets of our older PMEs to make them more relevant in their new jobs."